It is not just well centered stamps that come to us at PSE. This time I have chosen to showcase an item that seems to have been untouched by time. 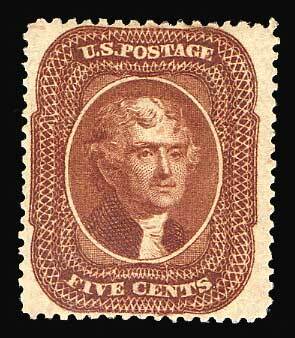 Issued a mere 150 years ago and still post office fresh including pristine gum, this stamp is so rare that even the powersearch feature at http://www.siegelauctions.com/ shows no examples. The 2011 Scott Specialized Catalogue of United States Stamps & Covers does not value this stamp in never hinged condition.